To know something about antique jewelry or antique jewellery one really has to dig into many (often complex) factors. Although we do not intend here to delve into matters in depth, the next chapters give a good idea on antique jewelry and what it's all about. Antique jewellery is jewellery that has reached an age of 100 years or more and that makes it a witness of human history. It is in generally used for previously owned jewellery and for jewellery made in earlier (style-)periods and not necessarily pre-worn jewellery. It is not a dequalifying designation as many pieces of antique jewellery typically feature fine workmanship and high quality gemstones, as well as one-of-a-kind items. Antique jewellery includes many decades or eras. Each of them has many different designs. These periods include Georgian, Early Victorian, Mid-Victorian, Late Victorian, Arts and Crafts era, Art Nouveau, Edwardian, Art Deco and Retro. Art Nouveau jewellery: The art nouveau age came as a revolt to the previous era of mass-produced goods. It featured free-flowing, curving lines. Floral ornaments and botanical designs are very typical as well as butterflies, dragons and female faces. The art nouveau age came to an end with the outbreak of world war one. Opals, and moonstone was popular and used in pendants, necklaces, and hair ornaments. For more on art nouveau. Edwardian jewellery: These jewels were popular for a very short time, during the reign or King Edward the 7th. This type of jewelry is generously decorated with gemstones, and diamonds. The gems were often set into very thin settings, and used in tiaras, necklaces, and earrings. Art Deco Jewellery: Art deco originated in France, as a protest to the art nouveau style. It was disregarded in its early period, but had a strong revival in the 1960's and 1970's. Its abstract designs and geometric patterns categorize the style, which also features very defined outlines, and bold colors. For more on Art Deco. Retro jewellery: Retro is a recent specification for the period in the forties when large scale, stylized geometric forms, drapes, bows or ribbons were all the rage. 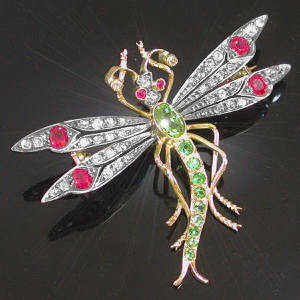 Pink gold jewelry, set with colored gemstones, sometimes in floral forms was very common.